'He doesn't think anyone else has his brilliance or integrity. And he cannot bear to stand a rival,' says journalist Aakar Patel, a longtime Modi observer who has translated Modi's poetry and his biographies of RSS leaders. What would India under a Modi Sarkar look like -- if the BJP were to come to power? Who would be the men and women running the show if Modi were to become prime minister? Is there a Modi wave? Is he the messiah of the middle class and how has he boosted Gujarati pride? "Gujaratis feel they were tarnished in 2002 nationally and the only man who spoke for them is today a globally recognised figure. Whether or not they are correct in feeling this pride is another thing," says writer-columnist Aakar Patel who grew up in Gujarat and started his career in the Gujarati newspaper Divya Bhaskar. Patel's columns are published in Mint Lounge, Mumbai Mirror and First Post. "Gujarat has the best mercantile culture of any Indian state. It would be wrong to assume that high rates of growth in Gujarat's economy are purely the work of the government, leave alone one man," says Patel. In an e-mailed interview to Rediff.com's Archana Masih, he discusses Narendra Modi's past in Gujarat and what his future in India's politics could be. What would India under a Modi government look like if Mr Modi were to come to power? That would depend on his majority. A BJP government with 200 seats will be as helpless as Manmohan Singh's. A Modi government with a full majority will be more dangerous, particularly on the foreign affairs front. And then there are the old RSS agendas like dislike of English. In Gujarat, Modi has denied English education to the poor till age 10. Gujarat's government schools teach ABCD only in class 5. This is why Gujarat has no stake in the services industries. Gujaratis like Ratan Tata (TCS) and Azim Premji (Wipro) who want to develop their software business have to look outside Ahmedabad, Baroda and Surat. A seven-year-old Gujarati in 2001 would be 20 today. Modi has denied access into the middle class to a generation of poor Gujaratis. What kind of an administrator is he? What is his style of functioning like? He is firm and disciplined. Whenever I have met him, it has been exactly on the appointed time. He prides himself on his attention to detail. His officers fear him and do not defy him. You have said that just as Modi has removed his challengers in Gujarat, he will do the same in Delhi -- so if there is a likely Modi Sarkar -- who are the challengers that he will get rid of? The ones he is threatened by. This includes popular figures and those who have a base of their own. It is not a coincidence that he has gone after L K Advani, Murli Manohar Joshi, Jaswant Singh and Sushma Swaraj. In Gujarat, he pushed away the powerful leaders because he cannot share power with them. He is highly insecure and only works with those who accept his absolute supremacy. The two Gujarat minister he depended most on -- Saurabh Patel and Amit Shah -- were denied Cabinet status for 10 years. How many times have you met him and what are your impressions about him? I first met him in 2002 just after the riots as part of an Editors Guild of India team. I have also interviewed him and met him in my time as an editor in Mumbai and Ahmedabad. 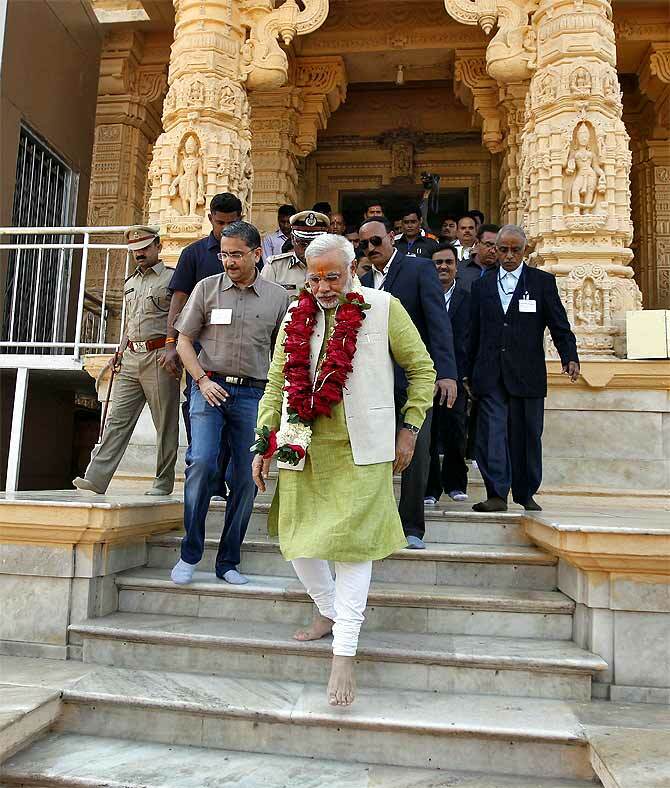 Image: Narendra Modi at the Somnath temple in Gujarat. You have also said that the BJP is no longer a party with a difference -- it has adopted the same high command culture like the Congress. Like Sonia Gandhi is the party high command in the Congress, Modi is and will be the high command in the BJP. Modi has made the BJP as loyalty-oriented a party as the Congress. The Gandhis have made the Congress their personal fiefdom. This is no different than what Modi has done in Gujarat. Funnily enough, in his late 20s, he wrote a book (called Sangharsh ma Gujarat) about the dangers of one-man rule. Does this mean that if he does become PM, he is likely to keep the key portfolios to himself? If he has a majority, yes. 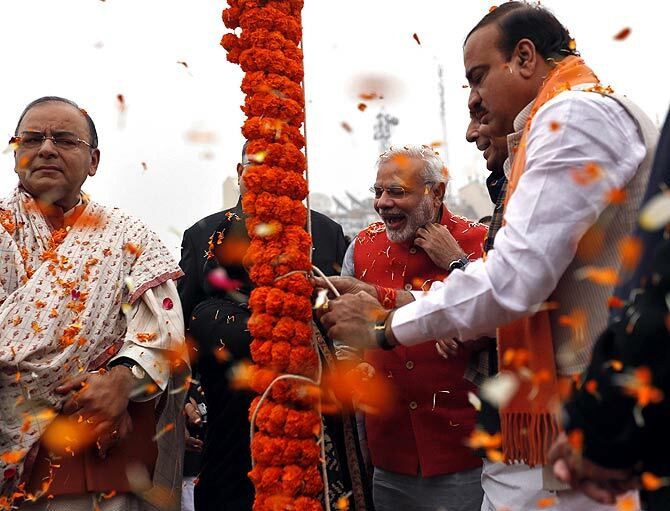 Image: Narendra Modi with Arun Jaitley, Ananth Kumar and Rajnath Singh at the Ramlila ground in New Delhi. Who will be the men and women running the show if Modi was to become PM? Amit Shah, Saurabh Patel, Arun Jaitley plus the team of bureaucrats he works with. Most of them are where they are because of their loyalty. What will be the influence of the RSS, how do you think he will alter Hindutva under his stewardship? Modi has a good equation with the current RSS hierarchy. He has been friends with Sarsanghachalak Mohan Bhagwat since 1970, when both men were 20. Bhagwat's father Madhukarrao was Modi's tutor for his third year in RSS training and Modi stayed with the Bhagwats in their Nagpur home in this period. Bhagwat accepts Modi as his superior and Modi is more influential on the RSS than it is on him at this point. 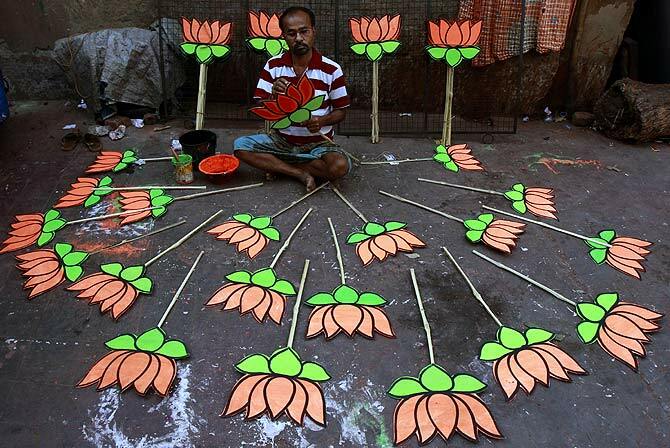 Image: Kashinath Bagh paints cut-outs of lotuses, the BJP's party sumbol, at a workshop in Kolkata. What will his legacy as chief minister be for Gujaratis and Gujarat? More than his personal one, it is the legacy of BJP rule in Gujarat that is relevant. With the Babri movement, the BJP has been divisive in Gujarat and the atmosphere at the mohalla level is quite poisonous. Gujarat under Modi is seen as the example of a developed state. Many believe Modi will usher that development to the rest of India. Hasn't he boosted Gujarati pride and given them something to be proud of? I think so. Gujaratis feel they were tarnished in 2002 nationally and the only man who spoke for them is today a globally recognised figure. Whether or not they are correct in feeling this pride is another thing. So far as development goes, Gujarat has the best mercantile culture of any Indian state. It has merchant castes even among its Muslims, which almost no other state has. It would be wrong to assume that high rates of growth in Gujarat's economy are purely the work of the government, leave alone one man. Whom do you think he will anoint as his successor in Gujarat? How will his departure from state politics impact the state? There are two possibilities. Administratively, the most competent is Saurabh Patel. He ran all the industrial and infrastructure portfolios (as minister of state) that Modi held the Cabinet rank for. Politically, it is Anandiben Patel. Modi's departure will not affect the BJP's politics, so long as he is around. He will continue to control the state unit firmly from Delhi. 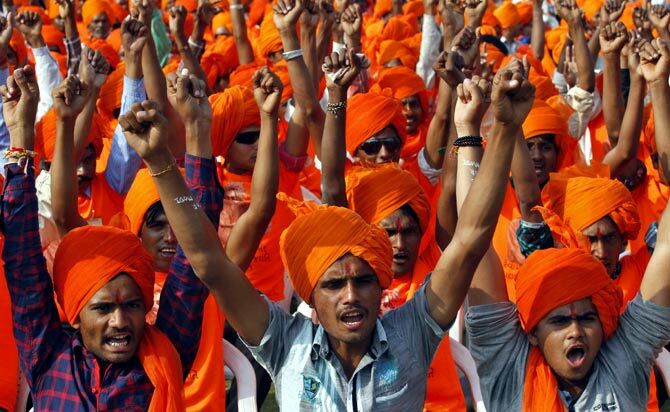 Image: Modi supporters during a rally in Ahmedabad. In your journalistic career, have you ever seen hope being pegged on one neta like it has been on Narendra Modi? Do you see a Modi wave in the politically dominant parts of the country? No, I have not seen such a mood. If we look at the states in which the BJP has a presence -- Maharashtra, Karnataka, Gujarat, Delhi, MP, Chhattisgarh, UP, Bihar, Rajasthan -- in none of them is the Congress expected to do better than the BJP. That is a sign that there is a wave in his favour. There is a comic book on the lines of Amar Chitra Katha called Bal Narendra, Childhood stories of Narendra Modi -- is Modi the new political superhero? Is there a cult of Modi that is drawing people to him? He sees himself -- and the middle class sees him -- in messianic terms. They think the problems of India are caused essentially by politics and can be resolved by one honest politician. M J Akbar, the well-known editor, who joined the BJP recently said that even under the most severe scrutiny in 10 years under the Congress, nothing has been found that directly links Modi to the Gujarat riots. Do you think the scars of Godhra are behind him? I think so. Not many care about 2002 any longer. Modi has not criticised or distanced himself from Mayaben Kodnani and he continues to persecute IPS officers like Rahul Sharma who acted against the rioters. But this isn't a problem for him. 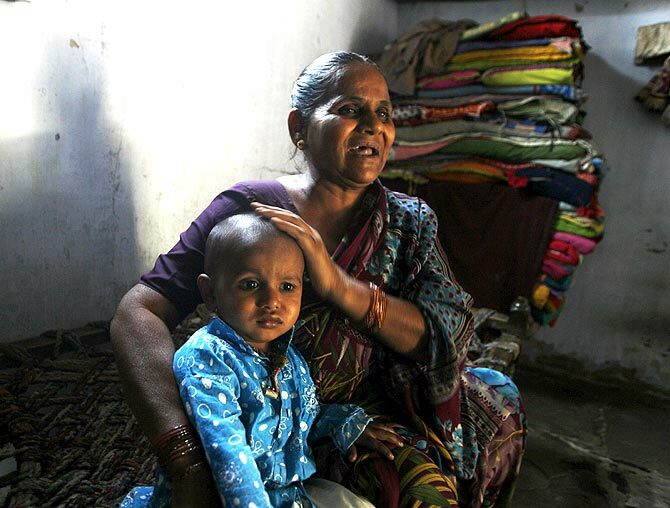 Image: Hajira Sheikh, a riot survivor, with her grandson at her home in the rebuilt Naroda Patiya. Sheikh's invalid mother was burnt alive by a mob in the 2002 riots. Sheela says:Is Modi being unfair to Advani?